If you happened to look up into the sky on Sunday, January 20th, you probably spotted a ‘blood moon’, also known as a lunar eclipse. Millions of people around the world enjoyed the sight as the moon slowly turned dark, and then red over a period of several hours. However, a few extremely sharp-eyed viewers noticed something extraordinary. During the eclipse, the moon apparently took a hit from a small meteorite. 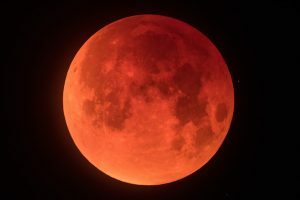 As the moon took on a distinctly redder shade just prior to midnight, EST, livestreams of the phenomenon showed a flash of light suddenly, and briefly emanating from the moon’s surface. From around the globe, people in their back yards caught extraordinary images of the lunar eclipse. Anthony Cook, an astronomical observer at Los Angeles’ Griffith Observatory which streamed the eclipse, thought it could have just been the camera’s random electronic noise. Then astronomers and citizen scientists started to share their detection of the flash on Reddit and Twitter. According to one backyard observer, they weren’t sure if what they saw was a local phenomenon, or something actually impacting the moon. With a check of two live broadcasts, one from Morocco, and the one from Griffith Observatory, the backyard scientist was sure that something really did happen. The only explanation was that something slammed into the lunar surface and obliterated itself. Picking up the impact was not easy, because the meteorite itself was extremely small. As a matter of fact, detection data from the Moon Impacts Detection and Analysis System, or MIDAS, found that the space rock was a pipsqueak of a meteoroid, only weighing something like 22 pounds, and measuring no more than 12 inches across, and it was likely not moving very fast. The impact itself showed up as a small flash of light for only an instant, and if you’d been watching the lunar eclipse, and blinked, you would have completely miss it. The moon is a multi-billion-year-old library of impact events, with fresh collisions still taking place frequently today. Capturing a lunar impact on video is rare enough, but this event — a collision during a total lunar eclipse — may be a first. “I have not heard of anyone seeing an impact like this during a lunar eclipse before,” said Sara Russell, a professor of planetary sciences at the Natural History Museum in London. NASA’s Lunar Reconnaissance Orbiter, which studies the moon’s surface, may soon spot the fresh crater. But the impact flash itself can be used to roughly estimate the size of the object that crashed on the moon, and its momentum. Based on NASA and European Space Agency databases of impact flashes, Justin Cowart, a graduate student in geosciences at Sony Brook University in New York, guesses that “it was probably somewhere between the size of an acorn and tennis ball.” That is quite different than the data from MIDAS, however, since this has never happened before, it’s not surprising that there are discrepancies. For the scientists to capture the extraordinary images of the lunar eclipse, and to broadcast them in ‘real’ time demands precision lenses of the highest caliber. At Universe Optics, we engineer and manufacture lenses to meet the growing needs for the military, the planetary sciences, medical equipment, and many more.